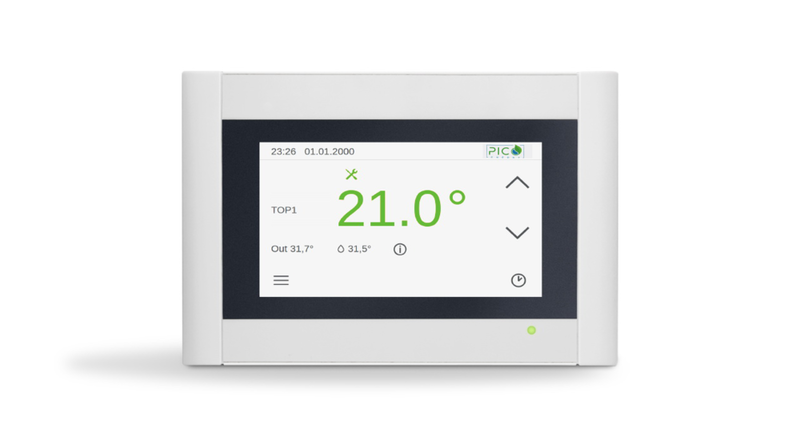 The Pico Energy inverter-driven heat pump operates on a principle of adjusting the output of the heat pump to match the energy requirement of the building. This enables the heat pump to operate as efficiency as possible, which enables a high seasonal coefficient of performance (SCoP). Being inverter-driven, the start current for the compressor is very low. This means that this ground source heat pump can be installed on a single phase electricity supply, despite having an output of up to 18kW. Heat Pumps with traditional fixed-speed compressors at outputs like this typically require a three-phase supply, which is not commonly available in the UK. By covering heat loads of up to 18kW, this high-efficiency heat pump will be suitable to provide a total heating and hot water solution for new build properties up to 400m2 and retrofit applications up to 300m2 (dependent on thermal properties of the building). The efficiency of the heat pump - referred to as the Seasonal Coefficient of Performance - is very high due to the adjustable output of the compressor meaning the heat pump only creates the exact amount of heat required of it. This means that an SCoP of up to an incredible 4.43 is achievable! This is good news not only for ensuring low running costs, but also for optimising your payments under the Government's Renewable Heat Incentive (RHI).